Knowing the story behind Microsoft's stock history reveals some clues about potential future successes. Few companies have been as successful as Microsoft (NASDAQ:MSFT) over time. By becoming the stalwart in operating system and office-productivity software when PCs first became available, Microsoft built a lasting franchise that has thrived for decades. 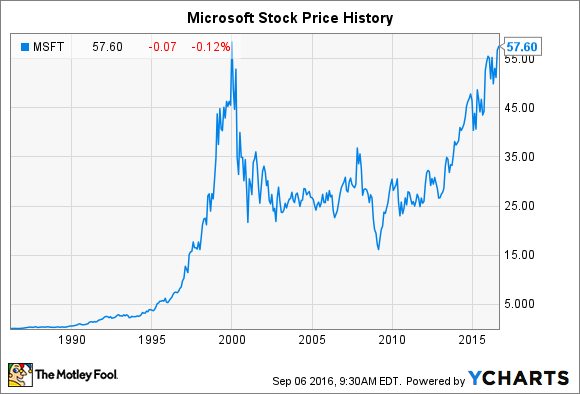 Looking back at Microsoft stock history, you can find some definitive periods of success that have corresponded to various growth areas. Below, we'll look at how fundamental business expansion, stock splits, and dividends have all helped produce big returns for Microsoft investors. As you can see above, Microsoft's stock history falls into three clear periods. From the 1980s to 2000, the tech boom helped carry Microsoft stock ever higher. That's also evident when you look at the Microsoft stock split history, which featured eight stock splits between 1987 and 1999. During that period, PC use became ubiquitous in the business and personal worlds, and the drive toward technological innovation created new applications for computers, not least of which was the rise of the internet and the resulting need for hardware that could keep up with the demands of sending and receiving data through networks. After the tech bust in 2000 to 2002, the growth prospects for Microsoft diminished considerably. The company continued to rely on its Windows operating system software and its Office suite of business productivity programs, and those two cash cows helped bring in consistent revenue and earnings. Yet efforts to keep up with its rivals weren't entirely successful, and Microsoft ended up ceding first-mover status in key areas like the portable music player, smartphone, and tablet to other companies in the tech space. Partially in recognition of the end of its fastest-growth period, Microsoft started making moves that reflected its status as a more mature company. It started paying dividends in 2003, and over time, it has made considerable increases to its quarterly payouts. Microsoft's dividend history shows that the company has been generous in sharing capital with its investors, making double-digit percentage increases in the payout numerous times. Since 2013, Microsoft has entered its most recent phase of its stock history, one that has been more lucrative for its shareholders. The share price has more than doubled in less than four years, and much of the progress that Microsoft has made has stemmed from recognizing its limitations and being willing to move in new directions. For example, Microsoft reversed its long-held reluctance to embrace the mobile revolution and instead started moving toward a greater focus on mobile and cloud computing. One key initiative was offering the key Office software suite in a mobile format, allowing users of devices from manufacturers other than Microsoft and its most trusted partners to have access to the software products. At the same time, Microsoft also worked toward evolving Windows toward a more mobile- and cloud-friendly operating system, with Windows 10 seeking to provide one single platform for all of its users' devices. That said, some investors remain skeptical at Microsoft's efforts to grow through acquisition. The company's most recent major purchase of LinkedIn (NYSE:LNKD.DL), on which the company spent $26.2 billion, is just the latest in a series of high-profile, high-ticket buys. Past purchases included Nokia's phone division as well as the Skype internet-based calling and video services, and Microsoft hasn't gotten the results from those purchases that investors have wanted to see. More successful have been Microsoft's moves to build partnerships. By working with Samsung, Lenovo, and other makers of mobile devices, Microsoft has arranged to have key productivity apps preloaded on smartphones and tablets that run the Android operating system. That doesn't prevent companies from choosing alternatives from Alphabet's (NASDAQ:GOOG) (NASDAQ:GOOGL) Google division. But given how Google traditionally enjoyed a competitive advantage by having the operating system on Android phones in the first place, Microsoft's ability to challenge Google is a good example of how Microsoft is trying to defend its turf more effectively. Looking forward, Microsoft appears to be in a new era of growth. The stock's performance probably won't match what it gave investors during the 1980s and 1990s. But for those who've waited patiently through tough times for the tech giant, Microsoft's recent gains are a welcome sight, and shareholders hope that the good times will last well into the future.